The concept of art and technology seems worlds apart for many people, but for the founders of Alpha’a, Manuela Seve, and Renata Thome, this was only a challenge and a matter of time before a traditionally restrictive market would see the light, and they want to be the tool that brings this transformation to life. Alpha’a’s story began in Rio de Janeiro, at the end of 2014, the company launched the first version of the platform via a partnership with a group of major Brazilian galleries and artists. The partnership took place via a t-shirt initiative that funded 25 scholarships for up and coming artists. Alpha’a was sponsored by Art Rio and launched the project during the art fair. 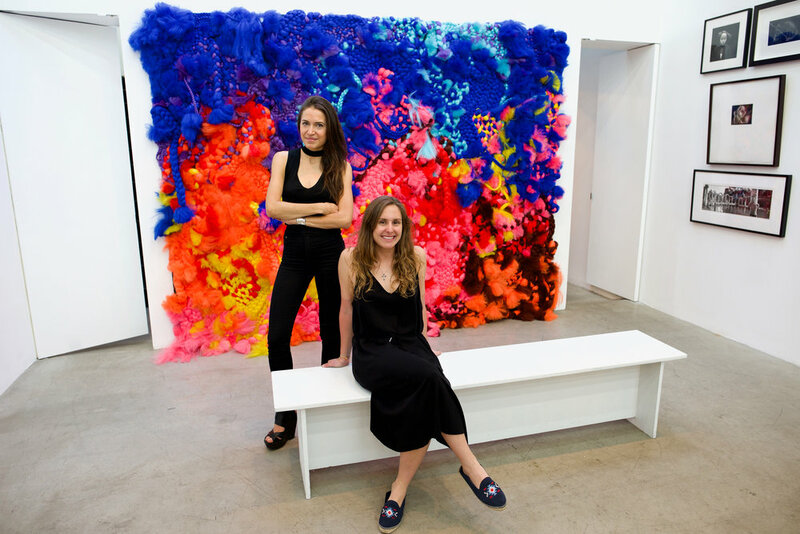 In the beginning of 2015 as Renata moved to Rio and joined Manuela in a leadership position the crowdsourcing platform came to life and started attracting up and coming artists. As the platform’s reach grew so did their partnership network, promoting young collector’s events together with Christies and talks at the Fasano Hotel were a bi-weekly occurrence, Alpha’a’s focus on creating content and building out a network grew further and further, this was leveraged by Manuela’s family experience in the art world, her father and uncle founded one of the oldest galleries in Brazil “Galeria de Arte Ipanema”. Renata, on the other hand, had just moved back to Brazil after spending almost ten years abroad and brought with her experiences from major art institutions such as David Zwirner where she interned in New York and worked with during art fairs. Together they were both insiders and outsiders and their shared objective of democratizing and bringing technology to a very analog market pushed them even further. In 2016 Alpha’a started demoing the company in the US and joined an NYC based accelerator Serval Ventures, during this process they raised their first institutional money and decided to export the project from Brazil to the world. In 2017 Alpha’a became a US-based entity, and the founders Manuela and Renata relocated to NY. Over the past 12 months the company grew their focus on not only making the arts more accessible but in using the visual arts as a tool for transformation, partnering with NGO’s such as oceanic.global and building out massive campaigns, such as: the artivism challenge where artists were challenged to create works around topics in ocean conservation. Their latest endeavor Arte Naturalista, a series of illustrations that aims to promote the work of a group of amazing new artists curated and edited by Daniel Moraes. Through the beauty of the illustrations, the project raises awareness on environmental issues and sustainable practices. Arte Naturalista is a project organized by IPTI, a non-profit organization that aims to integrate art, science, and technology into a systematic and evolutionary pathway to foster development in children and adolescents in underserved communities. This organization brought an art teacher into these communities in Santa Luzia do Itanhy, Sergipe Brazil and taught adolescents how to use graphite and watercolors. This project will be launched by Alpha’a as a series of prints at West Elm Broadway, on August 18th and September 8th.